Neisseria meningitidis is a gram-negative diplococcus. Meningococci are classified into serogroups on the basis of the composition of the capsular polysaccharide. The 6 major meningococcal serogroups associated with disease are A, B, C, W, X, and Y.
Person-to-person transmission occurs by close contact with respiratory secretions of a person with meningococcal disease or asymptomatic carriage of N. meningitidis. Asymptomatic carriage is transient, affecting an estimated 5%–10% of the population at any given time. 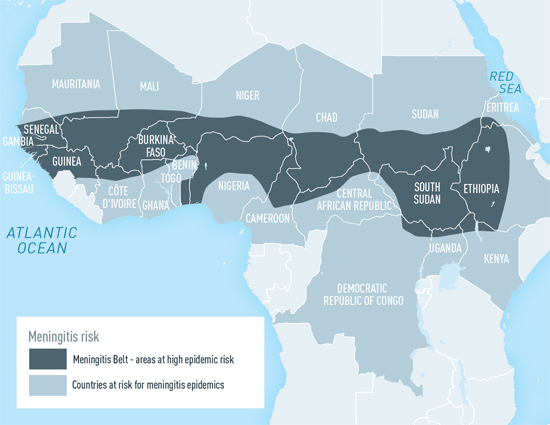 N. meningitidis is found worldwide, but the highest incidence occurs in the “meningitis belt” of sub-Saharan Africa (Map 3-11). Meningococcal disease is hyperendemic in this region, and periodic epidemics during the dry season (December– June) reach up to 1,000 cases per 100,000 population. By contrast, rates of disease in the United States, Europe, Australia, and South America range from 0.15 to 3 cases per 100,000 population per year. Although meningococcal outbreaks can occur anywhere in the world, they are most common in the African meningitis belt, and large-scale epidemics occur every 5–12 years. Historically, outbreaks in the meningitis belt were primarily due to serogroup A. However, with the introduction of a monovalent serogroup A meningococcal conjugate vaccine [MenAfriVac] in the region starting in 2010, recent meningococcal outbreaks have primarily been due to serogroups C and W, although serogroup X outbreaks are also reported. Outside the meningitis belt, infants and adolescents have the highest rates of disease. In meningitis belt countries, high rates of disease are seen in people up to age 30 years but are highest in children and adolescents aged 5–14 years. Risk for travelers is highest in people visiting meningitis belt countries who have prolonged contact with local populations during an epidemic. The Hajj pilgrimage to Saudi Arabia has also been associated with outbreaks of meningococcal disease in returning pilgrims and their contacts. 1 Disease data source: World Health Organization. International Travel and Health. Geneva, Switzerland: 2012. Meningococcal disease generally occurs 1–10 days after exposure and presents as meningitis in ≥50% of cases. Meningococcal meningitis is characterized by sudden onset of headache, fever, and stiffness of the neck, sometimes accompanied by nausea, vomiting, photophobia, or altered mental status. Up to 20% of people with meningococcal disease present with meningococcal sepsis, known as meningococcemia. Meningococcemia is characterized by an abrupt onset of fever and a petechial or purpuric rash. The rash may progress to purpura fulminans. Meningococcemia often involves hypotension, acute adrenal hemorrhage, and multiorgan failure. Among infants and children aged <2 years, meningococcal disease may have nonspecific symptoms. Neck stiffness, usually seen in people with meningitis, may be absent in this age group. The case-fatality ratio of meningococcal disease is 10%–15%. Early diagnosis and treatment are critical. A lumbar puncture should be done to examine the cerebrospinal fluid (CSF) and perform a Gram stain. If possible, the lumbar puncture should be done before starting antibiotic therapy to ensure that bacteria, if present, can be cultured from CSF. Diagnosis is generally made by isolating N. meningitidis from blood or CSF through culture, by detecting meningococcal antigen in CSF by latex agglutination, or by evidence of N. meningitidis DNA by PCR. The signs and symptoms of meningococcal meningitis are similar to those of other causes of bacterial meningitis, such as Haemophilus influenzae and Streptococcus pneumoniae. The causative organism should be identified so that the correct antibiotics can be used for treatment and prophylaxis. Meningococcal disease is nationally notifiable. Meningococcal disease is potentially fatal and should always be viewed as a medical emergency. Antibiotic treatment must be started early in the course of the disease, and empirically prior to the diagnostic test results. Several antibiotic choices are available, including third-generation cephalosporins. Six meningococcal vaccines are licensed in the United States. Refer to Table 3-14 for more information about available meningococcal vaccines. Approximately 7–10 days are required after vaccination for the development of protective antibody levels. The Advisory Committee on Immunization Practices (ACIP) recommends routine administration of a quadrivalent meningococcal conjugate vaccine (MenACWY) for all people aged 11–18 years. A single dose of vaccine should be administered at age 11 or 12 years, and a booster dose should be administered at age 16 years. Routine immunization with MenACWY is not recommended for other age groups in the United States, with the exception of people at increased risk for meningococcal disease. Those at increased risk for meningococcal disease include people who have a persistent complement component deficiency (C3, C5-9, properdin, factor D, or factor H or people who are taking eculizumab [Soliris]), people who have functional or anatomic asplenia, or people with HIV. Vaccine, product, number of doses, and booster dose recommendations are based on age and risk factor and are described in detail for each risk group in the 2013 ACIP Meningococcal Disease Recommendations (www.cdc.gov/mmwr/preview/mmwrhtml/rr6202a1.htm). Adolescents and young adults aged 16–23 years may also be vaccinated with a serogroup B meningococcal (MenB) vaccine to provide short-term protection against most strains of serogroup B meningococcal disease. The preferred age for MenB vaccination is 16 through 18 years. ACIP also recommends routine use of MenB vaccine for people aged ≥10 years who are at increased risk for meningococcal disease, including people who have persistent complement component deficiency and people who have functional or anatomic asplenia. ACIP recommends that travelers who visit or reside in parts of sub-Saharan Africa known as the “meningitis belt” (see Map 3-11) during the dry season (December–June) receive vaccination with a quadrivalent (serogroup A, C, W, or Y) meningococcal vaccine before travel. The preferred vaccine for people aged 2 months through 55 years and meningococcal vaccine-nonnaïve people aged ≥56 years is MenACWY, and MPSV4 is preferred for meningococcal vaccine-naïve people aged ≥56 years. Advisories for travelers to other countries are issued when outbreaks of meningococcal disease are recognized (see the CDC Travelers’ Health website at www.cdc.gov/travel). For infants aged <9 months, MenACWY-CRM (Menveo) is the only licensed vaccine that protects against serogroups A and W and therefore should be used for travelers in this age group. In children initiating vaccination at 2 months of age, MenACWY-CRM should be administered as a 4-dose series at 2, 4, 6, and 12 months of age. In children initiating vaccination at 7–23 months of age, MenACWY-CRM should be administered as a 2-dose series, with the second dose administered at ≥12 months of age and ≥3 months after the first dose, although it can be administered as early as 8 weeks after the first dose before travel. For travelers initiating vaccination at ≥9 months, either MenACWY-CRM or MenACWY-D (Menactra) may be used. For travelers 9–23 months of age who receive MenACWY-D, 2 doses should be administered, with the second dose administered at ≥3 months after the first dose, although it can be administered as early as 8 weeks after the first dose before travel. Infants and children who received Hib-MenCY-TT (MenHibrix) are not protected against serogroups A and W and should receive a quadrivalent vaccine before travel. For most people aged 2–55 years, 1 dose of a MenACWY vaccine (MenACWY-CRM or MenACWY-D) is recommended before travel. Additional dosing instructions for people with HIV, asplenia, or persistent complement component deficiencies are available in the 2013 ACIP Meningococcal Disease Recommendations (www.cdc.gov/mmwr/preview/mmwrhtml/rr6202a1.htm). Because MenACWY vaccine is not licensed for use in adults aged ≥56 years, MPSV4 is recommended for people aged ≥56 years who have never previously been vaccinated with MenACWY. However, for people aged ≥56 years who were previously vaccinated with MenACWY or for whom multiple doses are anticipated, MenACWY is preferred. Additionally, in the event that MPSV4 is not available, MenACWY may be administered to any person aged ≥56 years. Travelers to the Kingdom of Saudi Arabia (KSA) for Umrah or Hajj are required to provide documentation of quadrivalent vaccine at least 10 days and no more than 3 years before arrival for polysaccharide vaccine and no more than 8 years before arrival for conjugate vaccine (see www.moh.gov.sa/en/Hajj/Pages/HealthRegulations.aspx). ACIP recommendations for adult travelers are to receive a booster dose if it has been ≥5 years since the previous MenACWY dose. Current visa requirements should be confirmed with the KSA embassy. Although the KSA Ministry of Health currently advises against travel to Hajj for pregnant women or children, these groups should receive meningococcal vaccination according to licensed indications for their age if they travel. International travelers at risk for meningococcal disease who were previously vaccinated with a quadrivalent vaccine should receive a booster dose: for children who received their last dose at <7 years of age, a booster dose of MenACWY should be administered after 3 years and repeated every 5 years thereafter if they live in or travel to a hyperendemic areas. For people who received their last dose at ≥7 years of age, a booster dose should be administered after 5 years and every 5 years thereafter if they live in or travel to a hyperendemic area. A monovalent serogroup A meningococcal conjugate vaccine (MenAfriVac) has progressively been introduced into meningitis belt countries since 2010 through mass vaccination campaigns. This vaccine is not available in the United States for travelers and is not recommended instead of the quadrivalent vaccines (MenACWY or MPSV4) for travelers who will be living in meningitis belt countries as it does not protect against serogroups C, W, and Y.
MenB vaccine is not recommended for people who live in or travel to meningitis belt countries, as serogroup B disease is extremely rare in this region. MenB vaccine is not routinely recommended for travel to other regions of the world unless an outbreak of serogroup B disease has been reported. Although MenB vaccine is not licensed in the United States for children <10 years of age. Some European countries have recently introduced MenB vaccine as a routine immunization for infants. Infants who will be living in these countries may consider MenB vaccination according to the routine infant immunization recommendations of that country. Low-grade fevers and local reactions, such as injection site pain, arm swelling, and pain that limits movement of the injected arm, are side effects seen after both conjugate and polysaccharide quadrivalent meningococcal vaccines but occur more commonly after conjugate vaccine. Symptoms are generally mild to moderate and resolve within 48– 72 hours. Severe adverse events, such as high fever, chills, joint pain, rash, or seizures are rare (<5% of vaccinees) with either type of vaccine. Although no clinical trials of meningococcal vaccines have been conducted in pregnant or lactating women, postlicensure safety data have not identified any serious safety concerns to the mother or fetus. Pregnancy or lactation should not preclude vaccination with MenACWY or MPSV4 if indicated. People with moderate or severe acute illness should defer vaccination until their condition improves. Vaccination is contraindicated for people who have a severe allergic reaction to any component of the vaccines. All meningococcal vaccines are inactivated and may be given to immunosuppressed people. In the United States and most industrialized countries, antibiotic chemoprophylaxis is recommended for close contacts of a patient with invasive meningococcal disease to prevent secondary cases. Chemoprophylaxis ideally should be initiated within 24 hours after the index patient is identified; prophylaxis given >2 weeks after exposure has little value. Antibiotics used for prophylaxis include ciprofloxacin, rifampin, and ceftriaxone. Ceftriaxone is recommended for pregnant women. Abbreviations: IM, intramuscular; SC, subcutaneous. 1 If an infant is receiving the vaccine before travel, 2 doses may be administered as early as 8 weeks apart. 2 For people with HIV, anatomic or functional asplenia, and people with persistent complement component deficiencies (C3, C5-9, properdin, factor D, and factor H or people taking eculizumab [Soliris]) should receive a 2-dose primary series 8–12 weeks apart. 3 Revaccination with meningococcal conjugate vaccine (MenACWY-D or MenACWY-CRM) is recommended after 3 years for children who received their last dose at <7 years of age. Revaccination with meningococcal conjugate vaccine is recommended after 5 years for people who received their last dose at ≥7 years of age, and every 5 years thereafter for people who are at continued risk. 4 Infants and children who received HibMenCY-TT and are traveling to areas with high endemic rates of meningococcal disease such as the African meningitis belt are not protected against serogroups A and W and should receive a quadrivalent meningococcal vaccine before travel. 5 If multiple doses are anticipated in people aged ≥56 years, such as those traveling or living to areas with hyperendemic or epidemic meningococcal disease, MenACWY vaccine should be used instead of MPSV4. Additionally, people who have previously received MenACWY vaccine before the age of 56 should receive boosters of MenACWY if they remain at risk. 6 In April 2016, FDA approved updates to the prescribing information for MenB-FHbp to allow for the administration of either a 3-dose schedule (0, 1–2, 6 months) or a 2-dose schedule (0, 6 months). The 3-dose schedule is preferred for groups at increased risk where more rapid protection is desired. American Academy of Pediatrics. Meningococcal infections. In: Kimberlin DW, Brady MT, Jackson M, Long SS, editors. Red Book: 2015 Report of the Committee on Infectious Diseases. 30th ed. Elk Grove Village, IL: American Academy of Pediatrics; 2015. pp. 547–58. CDC. Prevention and control of meningococcal disease: recommendations of the Advisory Committee on Immunization Practices (ACIP). MMWR Morb Mortal Wkly Rep. 2013;62(2):1–28. Folaranmi T, Rubin L, Martin SW, Patel M, MacNeil JR. Use of serogroup B meningococcal vaccines in persons aged >/=10 years at increased risk for serogroup B meningococcal disease: recommendations of the Advisory Committee on Immunization Practices, 2015. MMWR Morb Mortal Wkly Rep. 2015 Jun 12;64(22):608–12. Greenwood B. Manson Lecture. Meningococcal meningitis in Africa. Trans R Soc Trop Med Hyg. 1999 Jul-Aug;93(4):341–53. Halperin SA, Bettinger JA, Greenwood B, Harrison LH, Jelfs J, Ladhani SN, et al. The changing and dynamic epidemiology of meningococcal disease. Vaccine. 2012 May 30;30 Suppl 2:B26–36. MacNeil JR, Rubin L, Folaranmi T, Ortega-Sanchez IR, Patel M, Martin SW. Use of serogroup B meningococcal vaccines in adolescents and young adults: recommendations of the Advisory Committee on Immunization Practices, 2015. MMWR Morb Mortal Wkly Rep. 2015 Oct 23;64(41):1171–6. Rosenstein NE, Perkins BA, Stephens DS, Popovic T, Hughes JM. Meningococcal disease. N Engl J Med. 2001 May 3;344(18):1378–88. Stephens DS, Greenwood B, Brandtzaeg P. Epidemic meningitis, meningococcaemia, and Neisseria meningitidis. Lancet. 2007 Jun 30;369(9580):2196–210. Wilder-Smith A. Meningococcal disease: risk for international travellers and vaccine strategies. Travel Med Infect Dis. 2008 Jul;6(4):182–6. World Health Organization. Meningitis control in countries of the African meningitis belt, 2015. Wkly Epidemiol Rec. 2016 Apr 22;91(16):209–16.